The filmmaker discusses the American Dream, crummy jobs and his new work, The Pool. Chris Smith doesn’t set out to make films about class. “Honestly, it’s really just working instinctually to see what seems interesting to me,” he says. But class keeps popping up. His credits include the documentaries The Yes Men (2003), about a group of antiglobalization activists, and American Movie (1999), about a struggling horror director. Smith’s first feature was American Job (1996), about minimum-wage or otherwise menial labor. (Between films, Smith has his own day job–shooting TV commercials, including the celebrity Geico spots.) 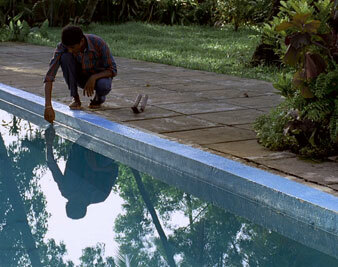 His latest film, the funny and very affecting The Pool, concerns a teenager named Venkatesh and his friend Jhangir. A room boy at a Goa hotel, Venkatesh becomes obsessed with a wealthy family’s gorgeous pool and gets tangled up in their lives. How did you decide to adapt Randy Russell’s story into The Pool? Four or five years ago, I went with some friends to help shoot a movie [in India], and we stayed at the hotel where the film [The Pool? CK] was made and observed the room boys and their interactions and their lives. That is what I was interested in, and The Pool provided me with the structure for a narrative story. Do you think The Pool is a universal story? Yeah, I do. Anyone can relate to working crummy jobs. And I think the humor is universal. One of the things that struck me when I was in India, spending time in this hotel, was watching the room boys have the same sort of banal conversations about, you know, nothing, and hiding out in rooms watching wrestling. There were things like that that just felt so universal to me. When Americans go and shoot India, it’s a very romanticized version or it’s poverty and slums. I felt like it would be interesting to show the day-to-day life of people working minimum-wage jobs. There’s a similar sort of boredom, and the same sort of odd things happen there that happen here. The film deals explicitly with class and caste. What was the mood on the set like? Eventually we had two people on our crew run and go get food and drinks and then came back and it was fine. But it was interesting. You would go into restaurants with the kids who were the stars of the film, and the waiters and people would look down on them, or they would come for our order and they wouldn’t ask them. One of the encouraging things about the film was how within our little world those borders were erased temporarily, and I think people really enjoyed that. We had these street kids acting with one of the biggest stars of India. I think the film has this as well. For a little period of time it erased these borders and showed people as human beings instead of where they fit in society. Jhangir and Venkatesh were amateur actors. How did you find them? Well, Jhangir was not an actor at all. He’d never acted before. He was working six and a half days a week at the restaurant that’s in the movie. Did you find him in the restaurant? Yeah, he was stocking–there’s a shot in the movie where he’s stocking bottles in a silver cabinet. We had just lost one of our actors, the friend character for Venkatesh, and we were just having a drink trying to figure out what we were going to do. And Kate, the producer, was watching Jhangir stock this cooler, and they made eye contact and she said, “I think this kid is really interesting.” He was actually managing the restaurant. He’s 11 years old but he was telling all these 40-year-olds what to do. Xavier, who was our location manager, owned the restaurant, and he said, “Oh, this kid’s amazing.” We did a screen test and it was immediately apparent that he and Venkatesh had this great chemistry. You can’t even imagine the film without him being in it. Are there similarities between shooting a documentary and using amateur or nonactors? I was attracted to things feeling very real. And the thing that I think I brought over from documentary is that I did extensive interviews with all the actors before we shot, and I was able then to take those interviews and incorporate stories from their real lives into the structure of the film. We became friends with all the people in the movie, so it wasn’t a very rigid thing, but it was direct in the sense that I needed to know this information in order to shape their character for the film. For the kids, asking them what they wanted to be, if they could have any job they wanted. Jhangir wanted to be an engineer and build big bridges [which he tells Venkatesh in the film]. There’s a scene where they’re working at the boss’s house and he’s cleaning a fish tank–that’s another thing I learned from the interviews. I always find these things don’t feel as contrived when they’re based in some sort of reality. You can see all these little bits of his interview seep into the narrative that way. Do you believe that the American Dream can be a reality? That if you work hard, you can get ahead? Yeah. Yeah, I mean, there’s a lot of factors that go into it–privilege, connections, luck–but I do. Even in this story, it’s about persistence and determination to some degree. I know that a lot of people work hard and don’t get any breaks and things don’t work out, but I guess I’m sort of a romantic to some degree. And not necessarily just to end up with financial wealth–even if it’s just finding some sort of personal satisfaction and contentment. Do you have a political background? I’ve always been attracted to politics because as you grow older you realize that that’s what’s controlling so many things. I was a cameraman on Michael Moore’s second documentary in 1996. I saw Roger & Me when I was 18 in a theater in Michigan forty-five minutes from Flint. That film actually had quite a big impact on me. And then I was really inspired by the fact that Michael went out with a 16-millimeter camera and made this film that was at the multiplex in my small town. Do you start with aesthetics or with the story? I think I’m just interested in characters who want to do something, who have a goal, however preposterous it may seem. They’re driven. I find that sort of endearing and charming. Whatever the outcome, these people want to do something with their lives.